If you've been waiting for Apple to recreate the Web through its browser revisions, you'll be disappointed. But if it's performance, speed, and standards support that you seek, Apple's latest browser update will do the trick. 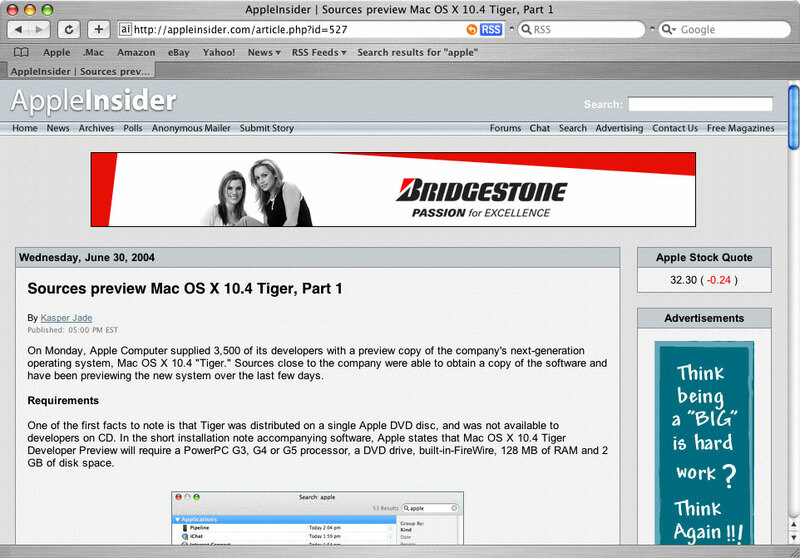 Tiger includes Safari 2.0, the first major revision to the toddling browser. Now that Safari has established itself as the primary browser for Mac OS X, its beginning to mature through a series of code optimizations and refinements. And while Safari does include a series of new interface features, its under-the-hood enhancements appear to be garnering the most praise. Apple also continues to improve Safari's compliance with web standards, fixing a number of Cascading Style Sheet (CSS) and rendering bugs and supporting more of the recently approved CSS 2 standard. 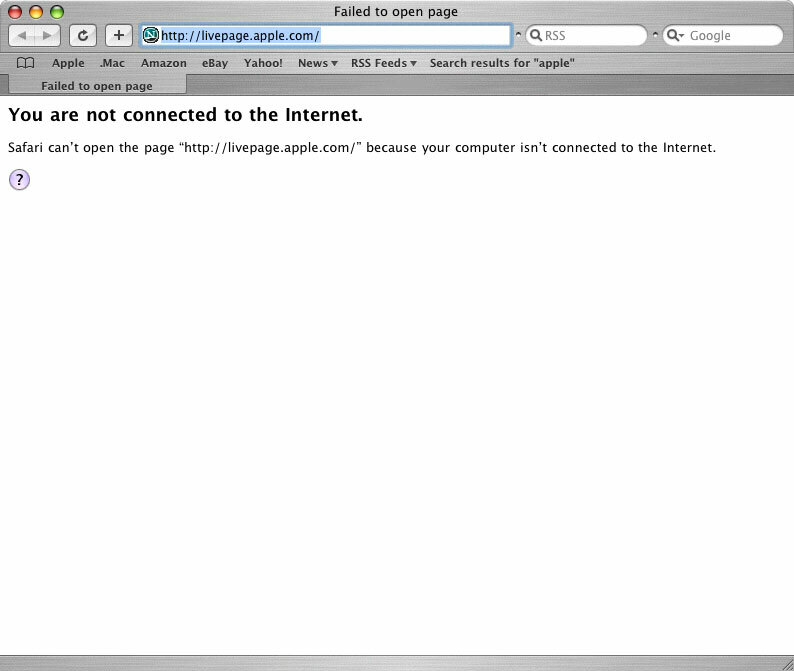 Perhaps one of nicest new features of Safari is the way it reports errors or connectivity issues to the user. Instead of beeping ominously and throwing a frozen dialog in users' faces when it cannot find a connection, Safari 2.0 reports these issues to users politely. "You are not connected to the Internet," Safari says inside its browser window, providing a link to relevant Mac OS X Help documents that will aid the user in troubleshooting the connection issue. Once online and browsing the web, Safari 2.0 will detect the presence of RSS feeds by displaying a blue RSS icon in the location bar. Clicking on the icon will toggle Safari into RSS mode and display a page with every headline and article summary from the feed, right in the browser window. In a sidebar to the right of the RSS content, Safari displays a slider control for customizing the displayed length of each article summary and controls for sorting and filtering displayed articles by Date, Title and Source. Safari allows users to bookmark RSS feeds as if they were web pages, and also provides a bookmarks directory for organization of feeds. Safari also allows searching of feeds. Similar to the already present Safari Google search, the new version of Safari presents an RSS search field in the button bar when operating in RSS mode. However, users may also include the RSS search field in the Safari button bar while it is functioning in browser mode. RSS search will allow users to perform keyword searches on all of their bookmarked feeds at the same time, displaying a combined results page. Users may even bookmark their searches, allowing Safari to update the custom news feed as new articles become available. Initial impressions of Safari search are mixed. Some sources note the speed of RSS search tends to degrade as the user adds more and more RSS bookmarks. Because RSS feeds are dynamic, and often updated by news sources multiple times daily, Safari RSS search must connect to each bookmarked RSS feed and download the latest data before performing its searches. As a result, Safari sometimes presents a prolonged pause before display RSS search results in the window. Apple says that the Safari implementation of RSS is standards-based, with support for RSS 0.9, RSS 1, RSS 2 and Atom. Since Tigers hook is pervasive searching, Apple has also added a bookmarks search to Safari, accessible from the bottom of the Bookmarks manager. Users may search page titles, URLs, domain names or any other information saved within their bookmarks. Sources also noted that Bookmark search is capable of searching a user's recent history, though Apple makes no mention of this potentially handy feature. For those users who care little about searching browser histories  or who would prefer not to have their habits tracked and searchable  Safari 2.0 will offer a new feature called "Private Browsing." 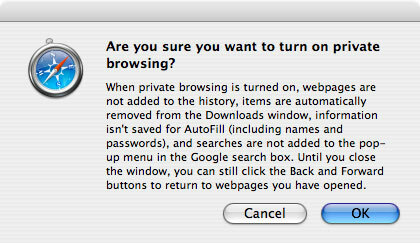 Private Browsing will protect a user's personal information on shared or public Macs when surfing the Web because no information about where the user visits or the personal information they enter is saved or cached. 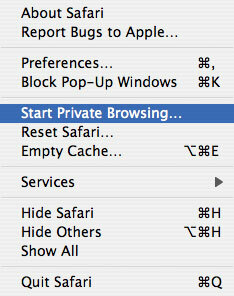 Users will be able to toggle this feature on and off from the Safari application menu. One of Apple's major internal goals while developing Tiger was to provide as much integration between applications as possible. The company wants the majority of its applications to work together more closely. Sources said this is an ongoing goal at Apple, and to expect similar enhancements in forthcoming versions of its iLife and other iApplications. 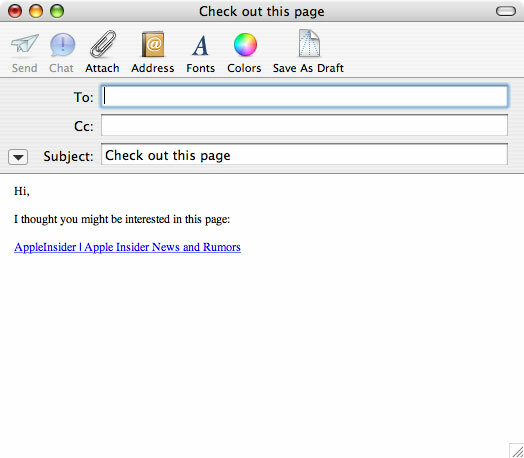 In Tiger, Safari 2.0 obtains some of this interoperability by interfacing with the Mac OS X "Mail" email client. Users will be able to email links to web pages, or the contents of web pages, instantly with the aid of command keys. While browsing a web page in Safari 2.0, typing command-i will quickly launch Mail and display a pre-generated message with a link to that web page. Holding command-shift-i takes this feature further, dumping the HTML contents of the web page into a new Mail message that is ready to be sent. Over the next 6 months, Apple is expected to further refine and optimize Safari 2.0. It's quite possible that the browser will boast even greater performance by the time it is released in retail versions of Tiger. Earlier today, Dave Hyatt noted some extremely interesting advancements to the underlying WebCore technology used by Safari; specifically how Tiger users can take advantage of Apple's "Spotlight" search technology on the Web. With Tiger sporting over 150 new features, AppleInsider plans to provide extensive coverage of the new system as information becomes available. Please stay tuned to AppleInsider for further installments of our coverage of Mac OS X 10.4 Tiger. 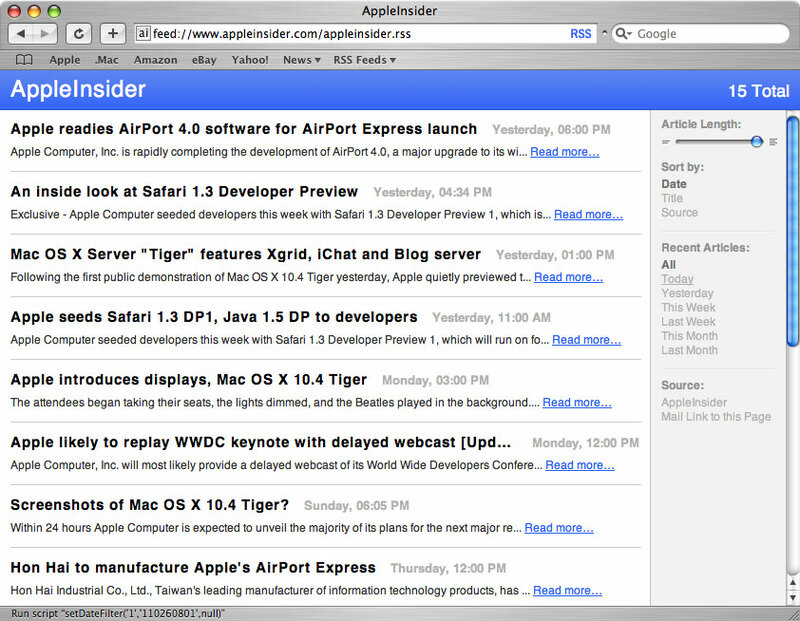 Yesterday AppleInsider began its coverage of Mac OS X 10.4 "Tiger" with a system overview. Plenty of additional Tiger details have begun to appear in the AppleInsider forums.